High-density lipoprotein (HDL) is known as good cholesterol since high levels of HDL are associated with lower risk of cardiovascular disease. Unlike its counterpart, low-density lipoprotein (LDL), whose actions are combatted by statins, clinical outcome trials for therapies that raise HDL levels have failed to show significant benefits for trial participants. Nearly 50 years ago studies demonstrated that HDL could collect cholesterol from circulation eventually leading to the size expansion model: as HDL collects cholesterol from for example the arteries, it grows in size until it is taken up by the liver for subsequent removal from circulation. Despite the prevalence of the HDL size expansion model in the literature, no one had ever actually directly observed it. The model has always seemed plausible since several studies in the last few decades appeared to have support it. However, the real test of any biological model is in the clinic, and the lack of clinical support of the classical HDL expansion model prompted us to reexamine the metabolism of HDL; but using a recently developed highly sensitive mass spectrometry method, parallel reaction monitoring (PRM). We knew that PRM could help us evaluate the size expansion of HDL in humans. Fig. 1. Monitoring HDL metabolism in humans by amino acid labeling and PRM. 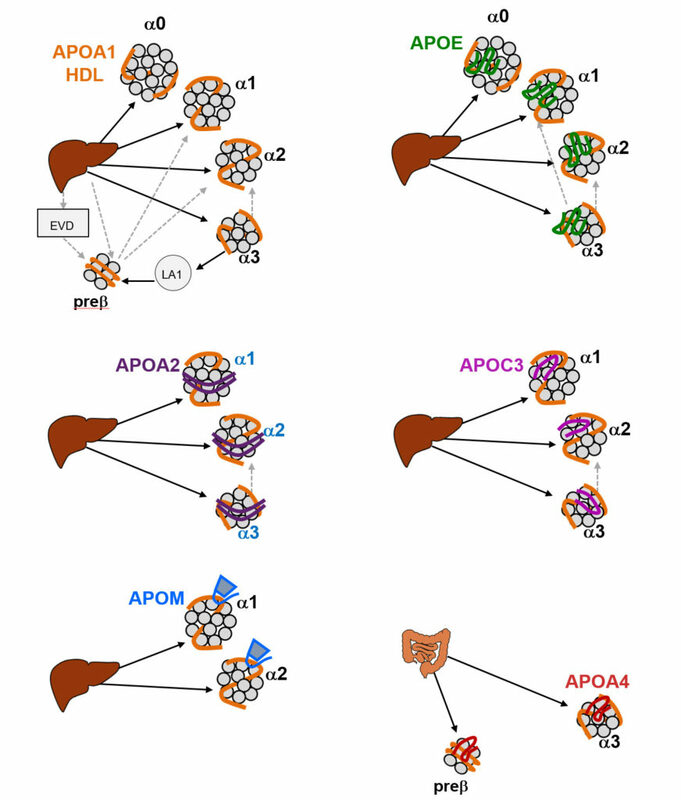 A, Strategy for Leu-based labeling of apoA-I/HDL in humans. Subjects are injected with stable isotope labeled Leu. Inset: Organs, primarily the liver, take up the Leu where it is incorporated into newly synthesized proteins such as those released onto HDL. The flux of labeled apoA-I through the HDL size expansion model is illustrated. B, HDL isolation and sample preparation for parallel reaction monitoring (PRM) mass spectrometry. Traditional HDL detection methods usually measure total HDL cholesterol, mostly since they are not sensitive enough to monitor HDL when its signal is split into its multiple size fractions. HDL is often detected by its major protein constituent, apoA-I. In order for us to monitor the metabolism of the different HDL particles (small prebeta to larger alphas), we recruited subjects and injected an amino acid tracer (labeled leucine, Leu) into their bloodstream (Fig. 1A). This tracer was taken up by primarily the liver, and then incorporated into the newly synthesized apoA-I protein that was released by the liver as an HDL particle. Fig. 1A demonstrates the theoretical movement of the Leu label in apoA-I/HDL as predicted by the size expansion model. We isolated apoA-I/HDL using an antibody that recognizes apoA-I and then prepared the HDL for PRM analysis by first native gel electrophoresis to separate the HDL size fractions, and then proteolysis to analyze the proteins’ peptides and Leu incorporation (Fig. 1B). Moreover, since the labeled leucine can be incorporated into other HDL proteins besides apoA-I and since PRM enables the measurement of multiple proteins at once, we also studied the metabolism of additional HDL proteins including apoE, apoA-IV, apoA-II, apoC-III, and apoM. Fig. 2. Multicompartmental models for apoA-I/HDL and five additional HDL proteins. The dark arrows mark major source pathways for each HDL protein; dashed/grey arrows indicate minor source pathways. EVD, extravascular delay; LA1, lipidated apoA-I. Once we collected the protein metabolism profiles across five HDL size fraction derived from three subjects we analyzed the data using mathematical formulas for compartmental modeling. Compartmental modeling attempted to fit the metabolism data according to the size expansion model, however to no avail. Instead, after several iterations of model design and fits, a best-fit model was finally achieved and it was a stark contrast to that predicted by the size expansion model (Fig. 2). Instead, we observed that most of the HDL size fractions appear in circulation by primarily direct secretion from the liver, with very minor contribution by sequential growth from small to large sizes as expected for the size expansion model. In fact, the smallest HDL size fraction, preb, is formed by the breakdown of the larger alpha3 particle. All monitored HDL proteins supported the direct secretion model including apoA-IV that is synthesized in the intestine (Fig. 2). Our novel and future findings on HDL metabolism enabled by PRM technology will be very important to examine the desired effects of new candidate HDL therapies, with the aim to achieve positive outcomes in the clinic. Multiple apolipoprotein kinetics measured in human HDL by high-resolution/accurate mass parallel reaction monitoring.